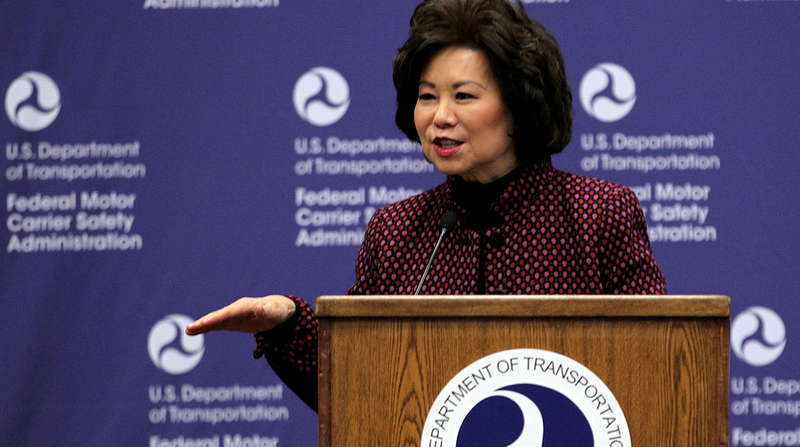 Transportation Secretary Elaine Chao announced on March 29 at the Mid-America Trucking Show in Louisville, Ky., that the NPRM had advanced. The contents of the notice are not yet public. FMCSA Chief Ray Martinez acknowledged that he can’t prejudge OMB’s action on the proposal, but he expressed optimism that it will keep moving “on a fast track.” Shortly after Chao’s announcement, Martinez conducted a live interview with Road Dog Trucking News on SiriusXM Channel 146. American Trucking Associations Spokesman Sean McNally said the group plans to provide comments on the proposal when it is made public. The Owner-Operator Independent Drivers Association was pleased with the progress. The organization petitioned the Federal Motor Carrier Safety Administration in 2018 regarding what it deemed necessary changes to the regulations that govern commercial truck drivers and the hours they work and drive. FMCSA officials combed through thousands of comments and gathered input on potential rule changes for months before submitting the NPRM to the White House. The agency published an Advance Notice of Proposed Rulemaking on Aug. 23 concerning the shorthaul HOS limit, the HOS exception for adverse driving conditions, the 30-minute rest-break provision and the split sleeper-berth rule to allow drivers to divide their required rest time in the sleeper berth. The ANPRM garnered more than 5,200 comments by the time the comment period closed Oct. 10. The agency also hosted five listening sessions nationwide to gather industry feedback. Should the agency expand the current 100 air-mile “shorthaul” exemption from 12 hours on-duty to 14 hours on-duty, to be consistent with the workday rules for longhaul truck drivers? Is there adequate flexibility in the adverse driving exception that currently expands driving time by up to two hours? If the 30-minute rest break after eight hours of driving did not exist, would drivers obtain adequate rest breaks throughout a daily driving period to relieve fatigue? Do you have information that would support reinstating the option for splitting up the required 10-hour off-duty rest break for drivers operating trucks with sleeper-berth compartments? During remarks at American Trucking Associations’ Management Conference & Exhibition on Oct. 28, FMCSA Chief Counsel Jim Mullen said that the majority of respondents recommended eliminating the 30-minute rest break. Mullen noted many drivers claimed they don’t mind taking 30-minute breaks but would rather not be told when to take them. Commenters also responded in favor of allowing drivers to divide their rest time in a sleeper berth instead of resting for 10 hours straight. The top vote among responders was for dividing rest hours into a 5/5 split. Mullen acknowledged the plethora of sleep studies, which run the gamut of defending both long, restorative rest and short sleep breaks. A recent analysis from the American Transportation Research Institute supports this idea, suggesting that certain “innovative HOS concepts” could help drivers avoid congestion by taking strategic periods of rest. The responses reflected a strong desire to extend the 100 air-mile “shorthaul” exemption to 150 air-miles, according to Mullen. Respondents also supported adding two hours of driving time in the case of adverse conditions. Mullen said the agency also has decided to reassess what constitutes adverse conditions. OMB now will review the proposal, which may take months. After the review, FMCSA will publish the NPRM and seek further public comment on possible rule changes.